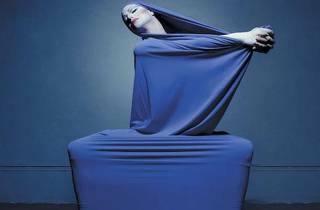 Google marked Martha Graham’s 117th birthday in May with an animated “doodle” on its home page, spelling out its own name backward using five of her most iconic moves. This year’s weeklong, fifth anniversary Chicago Dancing Festival, which begins Tuesday 23, focuses on American dance overall and, in particular, provides numerous opportunities to learn how and why the daughter of a Pittsburgh psychiatrist became one of the most influential artists of the 20th century. The Martha Graham Dance Company performs her Embattled Garden (1958) on August 25 and Diversion of Angels (1948) on August 27; the day between, catch a short documentary on Graham, A Dancer’s World, during an all-day dance-films festival at the Chicago Cultural Center. Graham died at the age of 96 in 1991. Five years later, NYC performer-choreographer Richard Move donned full Graham getup and performed as her in a one-off tribute to dance legends; the night also featured Robert La Fosse as Nijinsky and Maxine Sherman, a star with Graham’s and Alvin Ailey’s companies, in an early Ruth St. Denis solo titled The Incense. The cabaret would go on to become a popular, monthly variety show called Martha @ Mother; its format will be revived on Wednesday 24 at the MCA Stage. It was Move’s first performance as Graham, but his obsession with her wasn’t new. As a high-school sophomore in rural Virginia, he took his first modern-dance class at the Fredericksburg Dance Studio. At Virginia Commonwealth University and during summer study at the American Dance Festival, Move felt that Graham’s work and its rigor were swept aside in favor of “wearing pajamas and doing release technique,” he says. Move as Martha hosts an evening of short dances as part of the Chicago Dancing Festival on Wednesday 24.